Pressure cookers are becoming more and more popular with families because they provide an easy and quick way to make healthy meals for the family that require little work and minimal cleanup following the meal. They are very versatile kitchen appliances and can replace several other appliances in the kitchen including your slow cooker and rice cooker just to name a couple. Pressure cooking can make delicious meals in a fraction of the time it would take to make the same meal in the oven. Are you looking for the best pressure cooker options for your family and household needs? Read on below to see the benefits you can gain from the Fissler Vitaquick 8.5 quart pressure cooker. The Fissler Vitaquick Pressure Cooker 8.5 qt. is the perfect size for a family of 4-6 people. Its 8.5-quart capacity is the size most often recommended for families and for those who have never used a pressure cooker before. The 8.5-quart capacity can cook six servings of rice or 16 cups of soup. It is perfect for preparing stews, chili, and roasts. The shiny stainless steel pot of the Fissler Vitaquick is attractive, but this stovetop pressure cooker is also durable and functional. The cooker weighs a hefty 5 pounds. The pressure cooker can have substantial weight when full of food, but the sturdy handles make it easy to move. This UL-listed pressure cooker has patented safety features that make it easy to use. A blue indicator rod on the lid has two settings, ten psi, and 15 psi. Variable settings allow the user to adjust the pressure according to the foods being prepared. Another safety feature is the auto-locking handle of the Vitaquick. Only when the unit is securely closed will the appliance begin to build up the pressure. An automatic pressure release valve makes this pressure cooker almost mistake-proof and much safer to use. There are also several convenient features in this model. It can be used on all cooking surfaces, including convection cooktops. A scale inside the cooking pot allows the cook to measure food directly inside the cooking pot. The handle can be completely removed from the lid for easy cleanup, and the body of the pressure cooker is dishwasher-safe. The Fissler Company is renowned for quality cooking appliances and has been in business for over 170 years. The German company prides itself on quality craftsmanship and innovation. The Vitaquick Pressure Cooker is warranted for three years by the Fissler Company, which also guarantees that parts will be available for ten years after the model is discontinued. The Fissler website has abundant information including videos, product manuals, and recipes. Some of the recipes for this product include stuffed peppers, marinated beef Rhineland Style, and spicy carrot soup. I guess I decided I needed a pressure cooker after a saw an ad that said, feed your family “fast food.” I thought that was clever. I started thinking about all the fast food my family eats. It is so easy to pick something up at a drive through on the way home, after school and practice, etc. Meals became fuel—just something to get us by. I was curious why everyone claims that pressure cooked food is better for you. Does it really have more nutritional value? I decided to do some checking. It turns out that the claims about pressured cooked foods are true. Pressure cooking retains 90-95% of vitamins. By reducing the cooking time, the food keeps more of its nutritional value. By using less water than traditional methods, the food also keeps more of its nutrients. Pressure cooking makes grains and beans more digestible, and pressure cooking doesn’t produce carcinogens as grilling and roasting does. 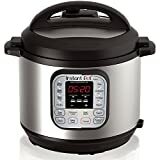 When I saw The Fissler Vitaquick Pressure Cooker in Bon Appetite Magazine, I knew this was the pressure cooker I wanted. First, it looks fantastic, and second, it is straightforward and easy to use. Yes, it is expensive, but I think it will last a long, long time. Its quality is obvious. I knew that I didn’t want a pressure cooker that had tons of functions. I didn’t want to learn a new appliance. Really, I just don’t have time. The Vitaquick was super easy. It has only two settings, one that I can use for meat and stews, and one that I can use for veggies. I just measure the ingredients right in the pot. When dinner is over, I put the pressure cooker in the dishwasher. Pretty easy. It is the perfect option for someone who is new to the world of pressure cooking. Now I can cook a whole chicken while the kids make a salad. By the time I set the table, it is time to eat. The food that we cook in the pressure cooker has flavor, and it is good to know that it is nutritious, too. I can fix food fast—good nutritious food. Everyone likes dinner better now, and the fact that we sit down and eat together—well, that is a bonus. The Fissler Vitaquick Pressure Cooker may be expensive compared to many other stovetop models, but there are many advantages to this appliance. It is UL certified, which sets the industry safety standard. But the Fissler Vitaquick integrates safety with function and design. It has two pressure settings and can be used on any cooking surface. Since it is dishwasher safe, it is also easy to clean. For those who want a quality stovetop pressure cooker that is attractive, durable and easy to operate, them the Fissler Vitaquick is a great investment. The Fissler Company has a reputation for beautiful appliances, and the Fissler Vitaquick Pressure Cooker is another fine example. While the price tag on this pressure cooker may be quite a bit higher than other models, you definitely get what you are paying for when it comes to all the advantages. You can use this appliance to make a healthy home cooked meal for your family in a fraction of the time it would take with other conventional cooking methods like an oven. It is a good addition to the kitchen when you decide it is time to replace the stovetop pot and slow cooker you typically use for your meals. This steel pressure cooker provides the temperature and pressure you need for whatever you want it to do whether it is a fast meal or something that can be slow cooked to perfection. It gives you access to much healthier meals, and you’ll have a much easier time preparing foods. I am considering purchasing the Fissler Pressure Cooker. There are so many sizes and I’ve never owned one. Can you guide my choice. I am not interested in accessory parts just the pressure cooker. Any help you can give would be greatly appreciated. Which way do you set the insert in the 8.5 pressure cooker?